This post contains affiliate links and I will receive a small commission if you make a purchase after clicking on my link. All opinions are my own! For more info, check out my disclosure policy. If you'd like to have a GPS-Guided version of this article, check out the app on GPSmyCity. Let's face it, Vegas can get kind of a bad rap. Mention that you're going on a trip there and people automatically assume you'll be carelessly gambling away thousands and partying drunk until dawn. While you could definitely do these things if you'd like, that's not necessarily everyone's scene. I've been to Vegas about five times now, once as a little kid, once as senior in high school, and then three times since I've been 21. 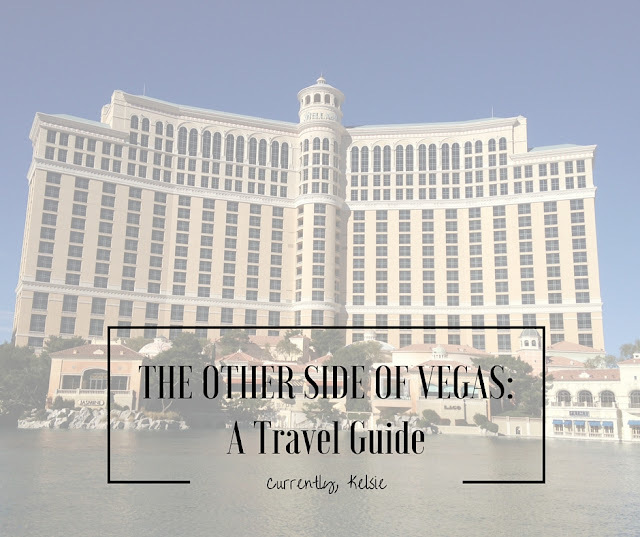 If you're like me, and are looking for a slightly different Vegas experience, here are some reasons you should still visit (and things to do while you're there). Vegas can be an excellent, budget friendly travel destination! We just returned from a late February visit to Vegas, and it was 75 and sunny every day we were there. If you're looking for a great place to soak up some sun poolside, Vegas is a great choice. You don't have to worry about rain, and though it can get really hot in the summer, it's a dry heat. So if you're from Missouri or any other super humid place, Vegas's 100 degree temps feel like nothing. Fall and early spring are also great times to visit. We used our Southwest points to fly to Vegas, partly because it was so dang cheap to fly there from Kansas City. If you're looking for a warmer getaway, Vegas is a great option because they are always having good flight deals (even if you aren't booking with points). It is substantially cheaper than a Florida flight if you're midwesterners like us. Once you actually get to Vegas, hotels are always really cheap- mainly because they want you to stay and gamble. But that's not a requirement- so book those $30 a night rooms. If you book with a player's card (even if you really never gamble), you can get even cheaper deals! Everything is open all of the time. Want to go eat something at midnight? No problem. Want to go play the slots for a few minutes? You can 24 hours a day. Feel like going shopping? Shops don't close until midnight. And if you're an early riser, there's always something to do then too. There is a little bit of something for everyone. We didn't actually go here on this trip, but I am friends with some Vegas locals who say Red Rock Canyon is absolutely amazing and breathtaking. There are lots of hiking options (and we already discussed how the weather is perfect). You just pay a flat fee to drive your car through the loop, and it could make for a family friendly trip to get a little exercise and see some breathtaking views of the mountains and the city! The View of the Strip from the High Roller! Our Valentine's Day Date. You can also ride the High Roller up to get a pretty awesome view of the strip. It's less than two years old and is the the highest Ferris Wheel in the world. If you go during the day time, it's cheaper, though I'm sure the night view is amazing. They also offer a local's discount, so if you know someone who lives in Las Vegas (who want to befriend someone who is), you can get an extra 50% off your ticket price! Throw the kids in the rental car and head to Hoover Dam for a little history lesson and some incredible views. Hard to believe that the construction began in 1931! There are lots of options for tours and different Hoover Dam experiences. We just pulled over and parked in one of the free parking areas long enough to walk around and see things, but you can make it a longer experience if you'd like! Hoover Dam & Las Vegas City Deluxe Tour - Save 45% on Tickets! Located about 24 miles off of the Vegas Strip, Lake Mead is the place to go for some fun on the water. You can rent boats, waterski, jetski, or just enjoy cruising around on the largest water reservoir in the US (when it's full). This reservoir is created by the Hoover Dam. No matter how many times I visit Vegas, there is always something about the Bellagio Fountains that just mesmerizes me. I'm always so impressed with the choreographed dancing fountains with lights, and there's nothing quite like standing in front of them on a cooler evening once the sun has gone down. I could seriously sit and watch them all day...and the shows are free entertainment every 15 minutes from 8pm- midnight. There are also shows during the day at less frequent intervals. If you'd still like to do a little bit of gambling, I would recommend taking a rental car (which I'd recommend getting) or hopping on a bus or shuttle (which are often free with certain hotels) down to "Old Vegas". In the Fremont area, there is a lot to see, and the gambling is considerably cheaper. We went down a couple of times to find penny and nickel video poker, as well as $3 Blackjack. I don't mind gambling just a little bit for entertainment, and I could happily put in $20 and play all night on some nickel poker. Also, they serve you free drinks while you are playing, so you can take advantage of that if you'd like. Golden Nugget - Best Rates! I was getting gutsy and actually playing five in on my nickel poker. I won $12 and was pretty happy! I haven't actually gone to a Las Vegas show, because I'm happy enough just walking the strip and hanging out by the pool. But there are many people who live and die by Las Vegas shows and the gambling alternative they offer. You can go to everything from Cirque du Soleil to Magic to Comedy or just concerts in general. You may even want to plan your Vegas visit around a certain show or artist! If you're looking to book shows at a discount without breaking the bank, look into Tix4Tonight, which can save you a considerable amount! Save over $39 on single tickets to select Cirque du Soleil shows. Save Over 40% on 4 ticket packages to select shows. Tix4Tonight also has discounts on the big name Vegas buffets, which are my favorite because I like to sample basically every dessert they have (and there are a lot!) Vegas buffets can be pricey, but they are worth it if you like sampling lots of different types of food and enjoying seafood and high quality meats. You can also eat once and be set for the entire day if you time it right. Brunch and lunch buffets are cheaper than dinner, and weeknights are cheaper than weekends (just like most anything you do in Vegas is cheaper on weeknights). We enjoyed the Bellagio Buffet while we were there, and I've also had the Spice Market (Planet Hollywood) and Aria Buffets. So good! Honestly, one of my absolute favorite things to do in Vegas is just to walk up and down the Strip (which is actually Las Vegas Boulevard, but it's hard to miss). Every casino has a different theme and decor, from Paris, to New York, to Rome, to Egypt and more- you feel like you're honestly traveling the world in a matter of blocks. It's a very pedestrian friendly area, and there are lots of people pushing strollers around. Good shopping areas are the Forum Shops, the shops across from Bally's, and the Planet Hollywood Shops. Stay as close as you can to the Strip, and you'll never be farther than walking distance from plenty of places to walk and explore. Also, it's AMAZING in the morning. Empty and beautiful and peaceful- the perfect place for a morning run. Las Vegas See the Lights Tour - Book Now & Save! If it's at all possible, rent a car. It can be pricey to take a taxi to and from the airport. Parking is free, and having a car gives you the ability to eat and gamble off the strip, which saves you money! Plus, having a car means you can go explore Red Rock Canyon, Hoover Dam, Lake Mead, and even the Grand Canyon if you feel up for the four hour drive! 2. Stay as close to the Strip as you can. Though you'll love having the freedom of the rental car, it's nice to be able to walk anywhere you may want to, especially if everyone if your party is going to be doing some drinking. 3. Visit during the week if you can. Food, hotels, and flights will all be cheaper. 4. Visiting in any season is nice, but it's especially nice during the late spring and fall. Check your hotel website to see when their pools are open. Ours was open year round and heated at the Holiday Inn Desert Club Resort (which we stayed in for free because of an IHG promotion!). 5. Set a gambling/entertainment budget. If you do plan to gamble, bring only the amount of cash you want to spend. When it's gambled away, you're done. If you win a little, you can play more, or treat yourself to a new purse or nice dinner. Don't expect to win, just let it be a fun surprise if you do. 6. If you come from the east, stay on your normal time zone sleep schedule. If you do this, you'll be an hour or two or three ahead of the rest of the Vegas crowd, which makes for peaceful, less crowded mornings with cheaper prices! There's a little something for everyone in Vegas. You can make it fun with kids, with a whole family, with a couple, or with really anyone- and it can be a really affordable travel destination. Figure out what you'd most like to do, and then relax and enjoy the freedom of a fun vacation! If you've got questions, let me know! I want to go now! I had no idea airfare and lodging could be so inexpensive. Southwest doesn't fly out of Jackson, so our tickets would be a little more expensive, but it still looks like so much fun! You should definitely take a trip there, Abby :) I think you'd enjoy it! I always perceived Vegas as a place solely for partiers, but now I want to go! I went to college and Utah and now I'm kicking myself for never making a trip out there-it sounds like the perfect place for a warm and relaxing vacation! Next time I'm close I'm going to stop by, thanks for the different view!! I love Vegas! We go once a year and it's a blast every time! I love it too! So fun and nice to visit! 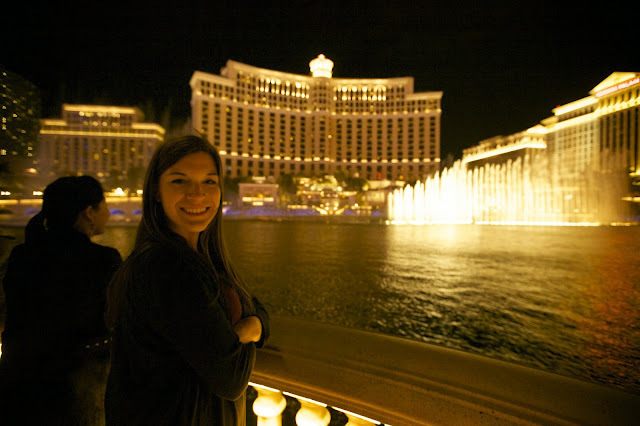 Love your Vegas Post..I did one in November about Vegas...ultimate style guide ..so much fun to blog about this place!! I go there for the Magic fashion tradeshow..going again in August. I love your picture of the Bellagio fountain..so gorgeous! Thanks so much! I bet your fashion post was amazing! I'll have to check it out. And thank you- I'm so obsessed with those fountains! Loved this post! I've only been to Las Vegas once, but it was just for a weekend & there is just far too much to see in one weekend! I haven't done half of the things you mentioned, so next time I go I will definitely be checking some of these places out! We did have a blast! I always enjoy it! You make me actually want to go to Vegas! I'll be honest, the go-to-bed early introvert in me was super overwhelmed the one time I went to Vegas. But I think if I could break up the trip with some of those other outings or trips to see lakes and such I would enjoy it! I'm so glad y'all enjoyed your little weekend getaway! We love Vegas! We usually go once a year, but it's been about 18 months, and I am feeling the need to go back! One place we venture to when we rent a car is The Valley of Fire, it's about and 1 1/2 off the strip, but soooo worth it, especially if you get there as the sun comes up, so cool! We also always go to Mon Ami Gabi for a boozy breakfast before everyone gets up! One tip, though, if you don't get a rental car, and don't want to take a taxi, there is Uber, which is way cheaper! I've never been to the Valley of Fire! I always run by Mon Ami Gabi- never been but it sounds delicious. Uber is great! I love Vegas! It's one of my favorite spots. I love the shopping, the sights, the shows, and just walking around. We're actually planning another trip soon. I love Vegas too!! So fun. We had a blast when we went to Vegas - we definitely hit up Freemont Street and went to a show. There is so much to do there, even if you aren't a gambler I would definitely recommend going! The next time we go, we want to see Hoover Dam. You are so right, Kalyn! Hoover Dam is really cool to see! I'm probably one of the few people that loves Vegas. I've been so many times, but surprisingly I've never been to Red Rock Canyon. I need to plan a visit. Looks like you had such a fun trip! I've been wanting to go to Vegas for a while and will definitely reference this when we go. All of this looks so fun! We hardly get to travel with my husbands work schedule, but this is on the top of my list! I hope you can make it happen, Kara! It's great! I've gone to Vegas a lot for work and I always head out to Valley of Fire which is about an hour away. It's a great park and my hubby loves to take photos there. Also, I like to eat off the strip in the Asian strip mall area - there are some of the best restos in the city there and lots of chefs eat there as well! You're the second person who has mentioned that! I've got to go there next time! And yum!! That sounds delicious. If you like Japanese try Raku, there is also a noodle shop 2 doors down that is amazing! Thanks for this guide! I'm hoping to go to Vegas this year with some friends and this is a great starting point for me! Thanks for reading! I hope you can go and have a great time putting these tips to use! This sounds like so much fun! I would like to do Vegas at least once in my life. My husband and I love to go to the local casino and see how many hours of slot machine fun $20 can buy us -- it's usually quite a bit! Vegas would be even more fun. :) I never realized there was good hiking out there too. Great idea! It is really fun, Brittany! You should definitely make a trip (and see some of these other sights). I'm right there with you- we always say that $20 is about what it would cost to sit in a movie, and instead we are talking and laughing, enjoying free drinks, and even winning occasionally ha! Thanks for reading! 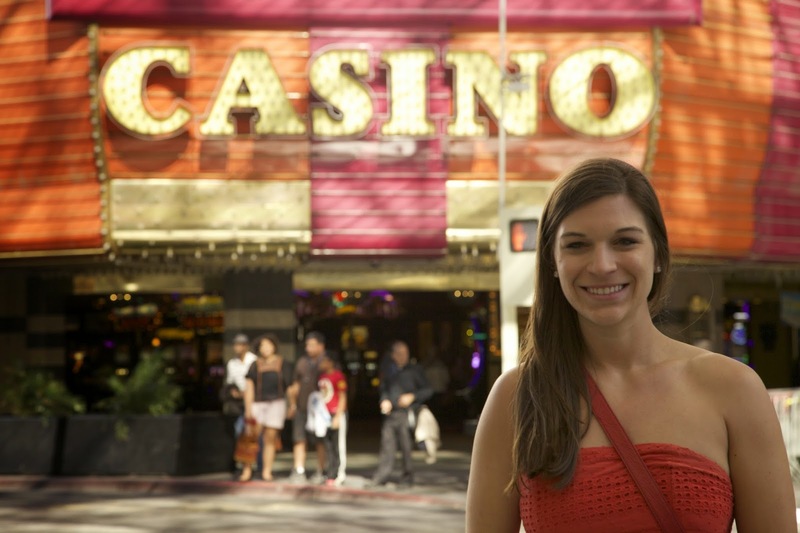 Great tips for a different kind of Vegas trip! I'm heading back to Vegas for the first time in years and bringing my boyfriend this time around who is not a fan of pretty much any traditional Vegas-related things (i.e. gambling, clubbing, pool parties, etc) so this will come in handy! I've been wanting to see another side to the city as well since I've only really seen the party side with past girls trips. Thanks! I hope it's helpful! There is a whole different side out there! This would be my kind of traveling, if I were to go to Vegas! I'm not a drinker or gambler, so seeing the other side is perfect. Thanks for the suggestions. We're actually going to Las Vegas in the Spring, so this post is so timely for me! I have family there we will visit as well, but since we're taking our two children, I was trying to think of things to do with them since we won't be gambling. I think the Grand Canyon and Hoover Dam will be some fun day trips to take while we're there and walking the strip during the day will probably be a lot less risqué! Thanks for all of the tips! We went for our wedding anniversary during the Christmas and New Year period. We had the best time ever! Highly recommended to visit.The pictures are amazing.